This Broadsheet column first appeared on Oct 2nd. It appeared there under the headline: Confidence, Supply And Demand though my preferred title is: St Leo’s next letter to the Corkonian? The news last night that one of the two Fine Gael T.D.s for Louth will henceforth be the Independent T.D. for Louth will gladden the hearts of very few in Fine Gael, not even the Dundalk Cllr selected only a few nights ago to replace him. While Peter Fitzpatrick may not have been of much strategic importance to the Taoiseach while he was an FG backbencher, he has improved his status now as an Independent – especially one whose support for the budget seems to be conditional. Fitzpatrick’s withdrawal of support for Varadkar’s minority government comes barely a week after another old school Fine Gael TD and Junior Minister, Catherine Byrne TD, put a shot across the bows of both the Taoiseach and his beleaguered Housing Minister. If long(ish) serving members of the Leo Varadkar’s own parliamentary party are having public misgivings about this government’s future, then why would Varadkar seriously expect the main opposition party to rush to commit to extend its Confidence and Supply (C&S) agreement for another year, once the Budget speech is done? The question is rhetorical as that probably is what he does expect. It is what he has been preparing himself and us. Over the summer we saw Varadkar writing lengthy homilies, in the guise of letters, at the Leader of Fianna Fáil like a latter-day St Paul writing to the Ephesians. In this Broadsheet.ie column I welcome the Irish government’s campaign to win a seat on the UN Security Council, but wonder just who precisely was the target of the high profile launch in NYC…? Last week the Taoiseach, the Tánaiste, the Minister of State for Defence and the Minister of State for the Diaspora went on manoeuvres in New York. While their jaunt was ostensibly to “launch” Ireland’s bid for a seat on the UN Security Council, their real purpose was more domestic. It was an impressive display. In addition to these four government members, curiously all of them from Fine Gael, were a former Irish President, the Defence Forces’ Chief of Staff, Bono, U2, a contingent of uniformed Defence Force members and an even bigger contingent of Irish political correspondents. If UN Security Council (UNSC) seats are allocated on the basis of display, then Ireland should be a shoo-in. But, UNSC seats are not won by those who just put on the best display. They are won by years of horse trading and deal making. 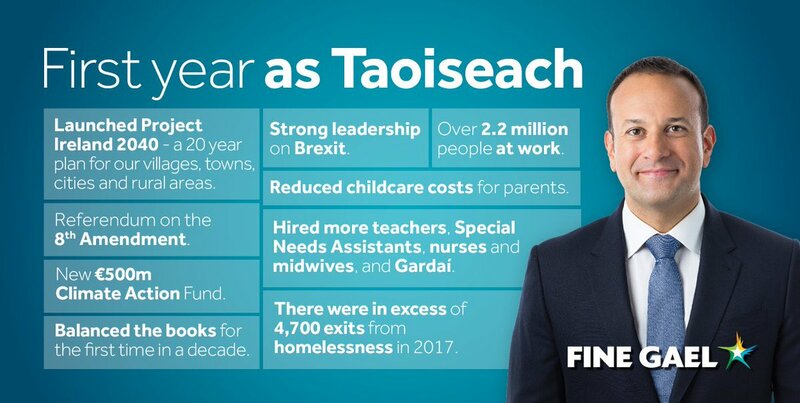 As part of the hoopla to mark Leo Varadkar’s first year as Taoiseach, Fine Gael produced a nifty infographic setting out some of the new leader’s biggest achievements. The list offers an interesting insight into what the Taoiseach cares most about or, to be more accurate, what the Fine Gael pollsters tell him that his potential voters care most about. Pride of place goes to the very frequently hyped national framework plan, Project Ireland 2040, followed by “Brexit Leadership” and the “8th Referendum”. At the other end you find “and gardai” shoehorned into a claim about hiring more nurses and teachers, followed by curiously worded item on housing, though the word itself fails to make an appearance. To avoid embarrassing Leo by putting a figure on the number of houses and apartments built over the past year, the copywriters had to come up with some phrasing that managed to convey the idea of progress, without breaching the standards in advertising code. The result is this extraordinarily clunky and impersonal boast that: “There were 4,700 exits from homelessness in 2017”. If ever a single phrase summed up Orwell’s description of political language “… as giving an appearance of solidity to pure wind”, it is surely this. It reads as if it came from the pen of someone who writes real estate ads. You know the ones, where “open plan apartment” means the bed is between the cooker and the lavatory and “close to nightlife” means the place is directly over an all-night, bikers’ bar. Last week’s Dáil furore and the heightened tensions between Fianna Fáil and Fine Gael persuaded me to use this week’s column to discuss the worsening relations between the main government and the main opposition parties. I still intend to do that, but in much lesser detail. The scandal engulfing the CervicalCheck scheme and the torment that Vicky Phelan, her family and hundreds of other families have been put through by the State and the HSE makes any discussion of the friction between the parties pale by comparison. But, as experienced political commentators have noted, the screening scandal has the makings of major political crisis if it were to emerge that more was known by the Department and, by extension, by a Minister. One of the nicest things about the run up to Christmas are those chance encounters with former colleagues and old acquaintances as you frantically rush around town looking for those presents you claimed you ordered online six weeks earlier. I had a few of those, but two may be of interest to you. Both involved high level civil servants, from different departments, who I knew from my time in government. After catching up with each on the whereabouts of mutual friends, we got to talking politics. Both reported that there was virtually no real policy work going on within government and that ministers, specifically the Fine Gael ones, were focused exclusively on PR, ferreting out any possible item of good news that may be in the pipeline and getting it announced ASAP, courtesy of the Strategic Communications Unit, with the maximum fanfare and hoopla. This is my Broadsheet column published online on December 19th last. “The word is not completely new, but its use has exploded over the last year… It is a word that has set the agenda and was given a lot of attention during the 2016 US election, and that attention has continued. Though they probably said it in Norwegian. Though idiom has its origins in last year’s U.S. Presidential slug fest between Trump and Clinton, it has come to be the hallmark of Trump’s presidency. A few months back we saw President Trump bizarrely claim, in an interview with fellow Republican nut job Mike Huckabee that was so soft (and full of crap) that it could have been sponsored by cushelle toilet rolls, that he invented the word “fake”. It is not only the charge Trump levels at established news organisations who put out stories or commentaries he does not like, it is also the tactic that Trump’s surrogates use to deflect criticism. Here is my Broadsheet column from December 12th – apologies for the delays in posting these columns on here… hopefully I will have my site updated completely later today (Friday). Though I did a bit of leaflet dropping for Fianna Fáil in the 1977 general election, the first election campaign in which I really canvassed was the 1979 European and Local elections. There I learned the skill of ‘marking the register’. This involved writing a letter after the voter’s name as it appears on the electoral indicating, after you had canvassed them whether you thought they were for Fianna Fáil (F), against us (A), doubtful (D) or where you got no reply (NR) or CB for call back. In 1979 there a lot of ‘A’s to mark on my sheet. These fell into two categories, the first were the people who voted FF two years earlier and were now very angry at how the country was going. The second were the group who had never and would never stoop to vote for “your shower”. When encountering a person from this second group, usually after walking up a long gravel driveway and climbing a flight of granite steps to reach the ornate front door, one of fellow canvassers, a very nice woman, several years my senior, would call out “NOCD”. Why @DefenceForces are a special case and deserve a far higher priority than govt is offering. I want to look back at last week’s 24 hour protest outside Leinster House by the wives and partners of members of our Defence Forces and offer two additional perspectives, which may help illustrate why the Defence Forces are a special case and worthy of a far higher priority than this government is according them. Before I get to those, it is worth noting why the protest was by the wives and partners. Under Defence Force regulations serving members of the Defence Forces may not make representations regarding any aspect of their employment, including pay and conditions, to third parties, including elected representatives. Though this may seem a bit draconian, it does reflect the particular nature of their job. Soldiers cannot simply down tools, especially when those tools are often loaded, and go on strike – particularly when they are one of the key services we depend upon in emergency situations. But there is, or at least there should be a quid-pro-quo in this relationship. At the time of writing this, it appears that the Taoiseach remains doggedly determined not to take the steps needed to diffuse this ministerial-made crisis. While sacking an old and valued colleague is not a pleasant task, it comes with the job. He is the Taoiseach, he hires and fires. He is also a politician and it must have been obvious to him since Friday that the mounting evidence of Frances Fitzgerald’s failure to act meant that that Dáil Éireann could no longer have confidence in her as Tánaiste or as minister. How did we get to this situation? Well, as with any crisis, we got to it one step at a time. Leo Varadkar did not start this week with a plan to trigger a snap election, no more than Micheál Martin did, but with a series of serious missteps Leo Varadkar walked this government to the brink and last night whipped things up to a point that the country is now on a course that means a general election either before Christmas or early in 2018. With those words it was clear that an Taoiseach was approaching the issue of Minister Fitzgerald’s level of knowledge on the campaign against Sgt McCabe satisfied that it had nothing personally to do with him and, so it was not something for him to be worried about.